Ihre ideale Ferienvilla für eine wohlverdiente Erholung! Die Ferienvilla "Les Glycines" ist ruhig gelegen, auf einem Grundstück von 2000 m², umgeben von Obstbäumen und landschaftlich angelegt. Kürzlich haben uns unsere Gäste für ihren Urlaub hier mit 5 Sternen bewertet! Das Dorfzentrum und die Geschäfte erreichen Sie mit dem Auto in nur 5 Minuten. Die schönsten Strände von Salento sind weniger als 20 km entfernt. Dear Herma, we are proud that you rate us a 5* score! We always try to do our best so that our guests enjoy a wonderful experience in our Villa. 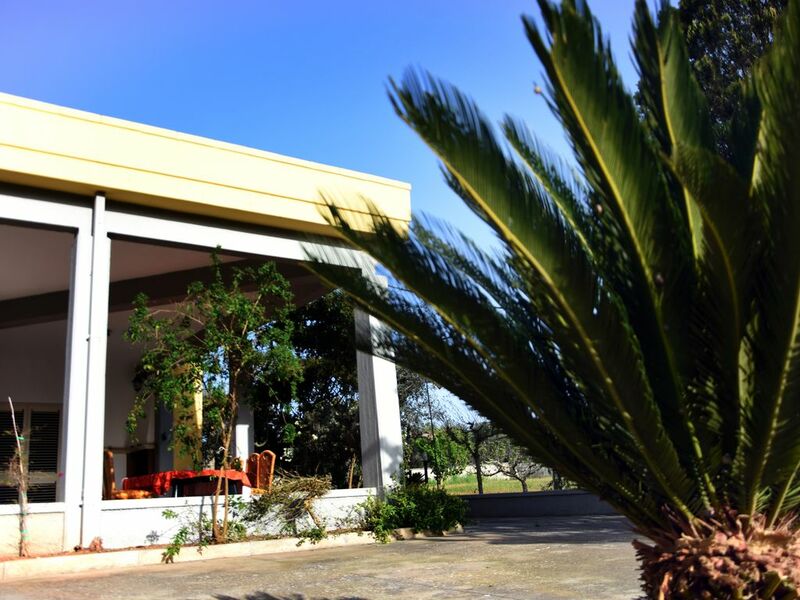 Thank your for having chosen our Villa for your stay in Salento. We are glad that you already foresee to come back next year! I'm sure you have enjoyed the early check-in that we offered you with no extra fee. Unluckily the Wi-Fi was not working well on the day you checked-in and we tried to do our best to get it back to normal. As we have not heard back from you during your stay, we supposed the network company fixed the problem. Regarding the cell phone coverage, I guess it depends on the roaming agreements between your national Dutch network provider and the Italian network. None of our previous guests did mention issues in connecting to their cell phone networks. You might agree that there are aspects of the overall travel experience on which we have little control. I'm sure you've nonetheless enjoyed your stay in our region, enjoyed the warm temperatures in March as well as spending some time connected to the nature and appreciating the wonderful landscapes that surround us. Abbiamo soggiornato in questa splendida villa in 5 coppie, villa in posizione strategica per poter girare facilmente tutta la zona bassa della puglia. Ben arredata e molto confortevole. Tiziana vi accoglierá facendovi sentire subito come a casa vostra. Il padrome di casa anche se non li fisicamente è sempre attento e pronto ad aiutarvi in caso di esigenze particolari. Felicissimi di ospitarvi Claudio e famiglia. Ci fà piacere sapere che la vostra vacanza nella nostra bellissima Villa vi abbia dato piena soddisfazione. Saremo felici di ospitarvi di nuovo in questo posto meraviglioso del Salento. E vero che quest'estate ci sono stati parecchi temporali nell'intera regione salentina, provocando quindi un po di umidità la notte. Per quanto riguarda il Wi-Fi, ci dispiace di non essere stati avvisati cosi che avremo risolto il problema di connessione. Forse bastava solo spegnere e riavviare il modem? Fin da ora nessun ospite ci ha mai avvisato di aver riscontrato problemi di connessione. Come lo dico ai miei ospiti, qualora ci fosse qualche domanda o qualche piccolo intervento necessario, informateci il piu presto possible. Cosi ci rimediamo subito e potete continuere a godervi appieno della vostra vacanza! We are pleased to know that your holiday in our beautiful Villa has given you full satisfaction. We will be happy to welcome you again in this wonderful place of Salento. It is true that this summer there were several thunderstorms in the entire Salento region, thus causing a bit of humidity at night. As for Wi-Fi, we regret not being warned so we will have solved the connection problem. Maybe it was enough just to turn off and restart the modem? From the time being, all our guests have been satisfied with the Wi-Fi connection. As I tell my guests, if there is any question or some necessary intervention, please let us know as soon as possible. So we'll get right back and you can continue to fully enjoy your holiday ! Gentilissimi e premurosi anche i proprietari e la Signora Tiziana che ci ha accolto. È stato un piacere per noi poter ospitare Franco. Una famiglia premurosa che ha considerato la struttura come fosse casa loro, rispettandone l'ambiente. Speriamo poter ospitarvi di nuovo prossimamente!